Team 1099 Pro is on standby to help filers comply with IRS and SSA Print / Mail and Electronic Filing requirements in their SOC I Type II secured facility. Why delay...start today. 1099 Pro Sales, Service Bureau and Support Teams are experienced, ready and secure - let them help you have your most successful tax season yet! 1099 Pro, Inc. is an industry leader in business tax software solutions with 20+ years’ experience. Customers eager to tackle IRS and SSA deadlines choose 1099 Pro year-after-year for their Software, Service Bureau and Support Teams. User-friendly 1099 Pro, W-2 Pro, 1042-S Pro, 8966 Pro and CRS Pro software products feature sample import files, a prior year Roll Forward Utility and simplified wizard interfaces. The SSAE 18 SOC I Type II certified Service Bureau is available to Print/Mail/eFile forms at economical rates. 1099 Pro Sales, Service Bureau and Support Teams are experienced, ready and secure—let them help you have your most successful tax season yet! Team 1099 Pro knows that January is a high-priority month for filers and offers January weekend support with extended hours and increased staff. Support options include the 1099 Pro Wiki, 1099 Pro Video Tutorials, Live Chat, context-sensitive help screens and complimentary email and phone support. Filers are encouraged to review critical deadlines to avoid significant IRS / SSA penalties for late filing. 1099 Pro Service Bureau customers should request their Service Bureau Upload Dates now; software must be renewed prior to scheduling and preferential upload dates go quickly. 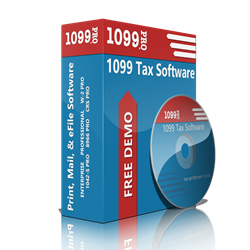 All 1099 Pro Software installs include sample import files in Microsoft Excel format. The 1099 Pro WIKI provides these import files plus detailed description of form specific fields and fast access to TY 2017 IRS / SSA forms and instructions; see updated 1099/W-2/1042-S/CRS Software field specifications. Users are strongly encouraged to review sample import files prior to creating their data file. Form 1042-S—Extensive changes including new Unique Form Identifier field, removal of Recipient TIN Type and U.S. Federal Tax Withheld Indicator fields, changes to Codes 33, 36-38 and 54 and more. Form 1098—Renumbered Box 10 Number of Mortgaged Properties and new Box 11 Other. Form 1098-T—New Rcp Tin Checkbox and Announcement 2016-42 regarding Limited Penalty Relief. Form 1099-OID—2016 Boxes 11-13 renumbered Boxes 12-14 and new Box 11 Tax Exempt OID. Form 1099-S—2016 Box 5 Buyer's Part of Real Estate Tax is now Box 6 and new Box 5 checkbox. Form 5498—Report late rollover contributions in Boxes 13a, 13b and 13c. Form W-2—New Box 12 code FF, introduction of leave-based donation programs and increased penalties. Form W-2G—Box 1 Gross winnings is now Reportable Winnings. The Combined Federal State Filing (CFSF) Program allows filers to submit forms directly to participating states when electronic filing with the IRS. The 1099 Pro Service Bureau automatically submits forms to the CFSF on behalf of filers at no additional cost. Unfortunately, numerous states and tax form types do not participate in this program. Thus, 1099 Pro customers turn to 1099 Pro Enterprise, Corporate Suite and W-2 Pro software to generate their own state subset files suitable for filing directly with those states that require direct reporting. Additionally, an increasing number of states require earlier, January 31st, reporting deadlines, such as: AR, AZ, CT, DE, GA, KS, ME, MN, MO*, MS*, MT, and NE. Other states, such as OR and WI, now allow only electronic filing—as opposed to paper filing—of virtually all tax forms. Filers reporting in these states should be aware of the updated filing requirements for Tax Year 2017 and ensure they have the proper 1099 Pro software in place before proceeding. 1099 Pro even provides a specialized utility, eFileViewer®, that allows customers to edit state files in order to add state specific information, such as the state reconciliation form data, that can be required in the states’ electronic files. On 12/10/2017 the IRS introduced Secure Access, a required two-factor authentication process for those users uploading directly to the FIRE Site. Users unable or not interested in completing Secure Access should consider the 1099 Pro Service Bureau for their eFiling and bulk Name/TIN matching needs. 1099 Pro, W-2 Pro, 1042-S Pro and 8966 Pro 2017 are available now for immediate purchase and download. Competitively priced, the demo version converts quickly into the full version upon purchase. Professional, Enterprise and Corporate Suite versions—in single and multi-user installs—are available to meet all users’ needs. Technical Support is always complimentary. Please see https://www.1099pro.com/products.asp for further details or contact 1099 Pro Sales at (888) 776-1099. Since 1989, 1099 Pro, Inc. has produced industry-leading tax reporting software for 1099 Informational Returns, W-2, 1042-S and FATCA 8966 forms. 1099 Pro software imports ASCII data and processes printing, electronic filing and corrections. 1099 Pro’s hosting and data facilities are SSAE 16 SOC I Type II certified. 1099 Pro, Inc. proudly entered the Common Reporting Software / AEOI Reporting Software field in Tax Year 2016.